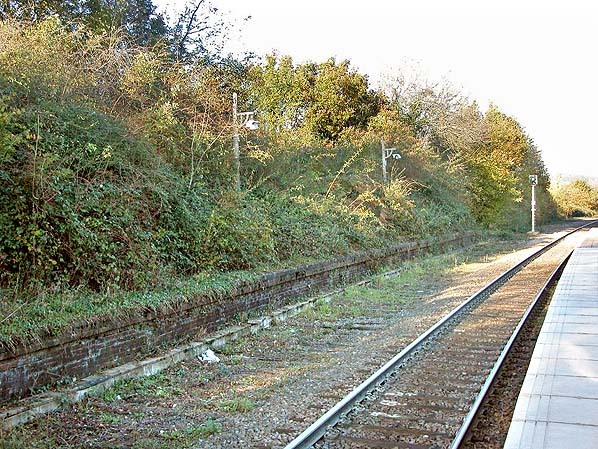 Present state: Although the station is still open, the line was singled in the mid 80's and the former down platform is now disused and overgrown and the track has been lifted. Notes: Goods services were withdrawn from Buxted on 2.4.1962. The station house, alongside the booking office was demolished in the mid 1980's. Within a month of the LBSCR obtaining their Act to build a line from Brighton - Hastings via Lewes, ideas were being put forward for a branch line from Lewes to the important agricultural centre of Uckfield. 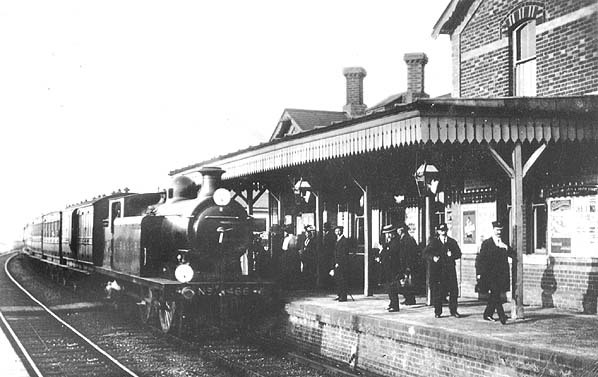 The line to Uckfield opened from Uckfield Junction on the 18th October 1858, 7 1/2 miles up the Ouse valley to Uckfield and within a year the LBSCR took over the independent company. For the first ten years the track ran from a junction off the line to Wivelsfield which had opened earlier in 1847. But this meant trains had to reverse at Lewes en route to Brighton and a new track was built in 1868 giving access to Lewes from the east. With the line pointing towards Tunbridge Wells the LBSCR were anxious to close the gap in their network and gave their support to the Brighton, Uckfield and Tunbridge Wells Company which was incorporated in 1861. Its 12 mile single track line opened on 3rd August 1868 from an end on junction at Uckfield to join the recently opened extension from East Grinstead - Tunbridge Wells at Groombridge Junction. The company was taken over by the LBSCR before the line opened. This was a further part of the Brighton Company's strategy to consolidate the area against competition from the South Eastern. When a further line was opened from Polegate to Eridge south of Groombridge Junction in 1880 the LBSCR had achieved its objective. In 1878 powers were obtained for a 1 mile long spur between Ashurst Junction on the East Grinstead - Groombridge Line and Birchden Junction, 1 mile north of Eridge on the Uckfield line. This enabled Groombridge to be bypassed without a reversal there. It remained largely unused until the final piece of the jigsaw was put into place with the opening of the Oxted & Groombridge Railway's line from Hurst Green Junction south of Oxted to Ashurst Junction. The local company was incorporated in 1861 and taken over by the LBSCR in 1864 four years before the line opened in 1888. Frequent trains to Tunbridge Wells, East Grinstead and Lewes and beyond were now possible and these continued to serve Uckfield until well into this century. Perhaps the station's heyday was in the late 1930s when a daily through service existed between Brighton, Maidstone and Chatham to the east and Brighton, Redhill and Reading to the west. After WW2 commuters and local passengers were on the increase, encouraged by a frequent service and competitive fares but by the 1960's the Beeching era had begun and in 1964 new timetables were introduced making travel difficult with long waits for connections, by now a common ploy to reduce the number of passengers. The railway board wanted to close the line south of Hurst Green Junction to Lewes, together with the branch to Tunbridge Wells West. This met with vigorous opposition from local authorities and private individuals. 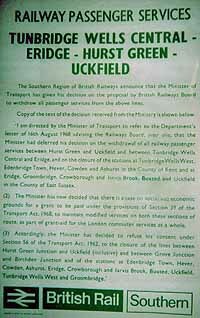 Eventually the Minister gave way and agreed closure between Uckfield and Lewes only and the date was fixed for 6th January 1969. Bickering followed and the licensing of replacement buses was deferred. The railways board then said the viaduct across the River Ouse was safe only on one line and a shuttle service was introduced. This did not fit in with trains north of Uckfield and traffic dropped still further. Eventually railway engineers insisted the viaduct should be completely closed. The railways then hired buses for a time and Barcombe Mills and Isfield stayed open to issue tickets. The buses could not negotiate the narrow winding road to Barcombe Mills, so the railways provided a taxi to take passengers from the railway station to the bus stop. But this was only after intending passengers had walked over a mile to the station to buy their tickets! The last train ran on 23rd February 1969 and buses finally stopped on 6th May 1969. In July 1985 BR issued a circular denying rumours of a line closure. Even so a scheme to 'rationalise' and re-signal the line northwards was undertaken and some sections were changed to single track and on 8.7.1985 the line to Groombridge and Tunbridge Wells West was closed. This line has now been restored and reopened as the Spa Valley Railway. In 1983 Isfield Station and a length of trackbed to the north were bought by the Milham family with plans to restore and reopen the station. The family started to relay the track but were unable to finish the project and the line was sold to the Lavender Line Preservation Society in the early 1990's. Isfield station has now been restored to early Southern Railway colours and looks very much as it would have done in the 1920's and 30's. The track has been extensively overhauled and modified since the society took over and the line has recently been extended to one mile operating a steam service as the Lavender Line, named after A E Lavender and Sons the coal merchants which used to operate from Isfield station yard. 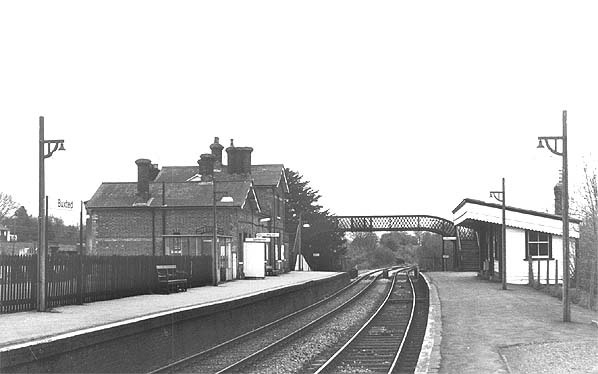 A blow to their campaign came in 1991 when Uckfield Station was resited to the north side of the level crossing. Initially the old station and route to the bypass was preserved in case it should be required for a future restoration of passenger service. Initially the local authority were enthusiastic about the restoration of the rail service between Uckfield and Lewes but in 1998 they decided that a land use policy to restrict development around the former route could not be justified. The campaign continues.